Many years ago, while travelling through South India by road, I was surprised to find that idli and dosai were available only at a particular time called “Tiffin Time.” I was equally surprised to learn that “Tiffin” is actually an English word! I also didn’t know that Pitla, a staple of Maharashtrian cuisine, is also a popular snack in Kerala where it is known as “pitlo.” Nor was I aware that in her first year of marriage, a South Indian Brahmin girl is invited to her maternal home to celebrate all the festivals, in much the same way as Maharashtrian girls! I was completely unaware of these and many other facts about the customs and eating traditions of the South Indian Brahmin, revealed ever so skillfully in Rukmini Srinivas’ Tiffin. The book is truly a feast for the mind, providing recipes interspersed between personal anecdotes and stories, a veritable compendium of “tiffin” or snacky food that can be eaten at any in-between meal times and occasionally substitutes as a light meal, taking the reader beyond the limits of idli and dosai that commonly define South Indian cuisine. Right from the attractive cover image inviting you to sample the pidi kozhukattai inside a burnished brass steamer, Rukmini Srinivas, an accomplished cook with her own television show, a storyteller, gardener entrepreneur, teacher, author, and, above all, a bon vivant, takes you through a gastronomic adventure that is a must-read for all those who remember a pre-Independence India that had all the innocence of a newborn child. It is also great reading for those born post-Independence and unfamiliar with the emergent ideas of the time that slowly eroded traditional caste and class barriers to create a more egalitarian and tolerant national identity. Rukmini’s journey starts from before her birth, when her father Naganathan, an orthodox Tamilian Brahmin from Tanjavur district, leaves the confines of his home to work with the British Defense Accounts department. He is soon joined by his young bride Sahayavalli, who gamely adapts to the alien ways of Quetta in present-day Pakistan and even learns to make a vegetarian Biryani from her Pathan landlady. It is this spirit of adventure and openness to learn that enabled the family to absorb and assimilate the various flavors and cultures to which they were exposed in northwestern and central India and to settle down seamlessly back home. What is remarkable is that throughout their travels, Rukka and her family manage to be true to the vegetarian tradition and to always find something acceptable to their preferences. Both in the introduction and in the end, Rukka reiterates that the book is not a biography, but how else would you describe a book that recounts her adventures in a culinary tradition? Each of the recipes is associated with a person or incident in her life: Dr. Chitappa her father’s youngest brother introduced her to midwifery and masala vadai; her father brought home a meat grinder to make vegetable cutlets; her mother made masala paratha for Pound Day at her school in Jubbalpore; and her Annam Athai introduced her to the feasts and fasts of the Hindu calendar. What I found most endearing was the account of her unorthodox meeting with MN Srinivas, the sociologist, during her days as a young geography lecturer at Madras’s prestigious Queen Mary’s College—a meeting that would culminate in a long and happy marriage. If life with her father took her all over India, life as the wife of an academic took her across the oceans. Besides being seasick for the most part on her maiden voyage, Rukka learnt that vegetarian food, as she understood it, was just not available in America in those days. She had no option but to cook her own food—not an easy task in an America where Indian food was totally alien and vegetarianism was unheard of! Used to the stone grinder for making spice powders, she was unfamiliar with the food processor and the electric mill. During her husband’s stint at Berkeley, she even borrowed the Metate or traditional stone grinder of the Native American Indian people courtesy of the Anthropology Department. Gradually she learnt to substitute traditional ingredients with local ones and tweaked some of the elaborate and time-consuming recipes by using modern equipment like the food processor and the refrigerator. Rukka’s recipes are simple to understand and use ingredients and implements that are available in the US. The recipes are introduced with interesting tips and suggestions for menu options and pairings. She puts her own mark on several dishes such that they are neither fusion cooking nor traditional enough to please the purist. 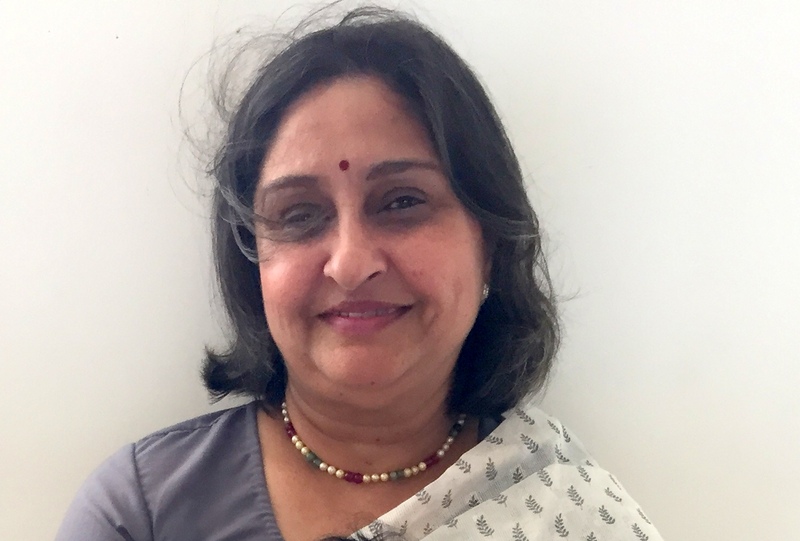 Srinivas’s book emerged from a simple request from her daughters studying overseas for recipes for some comfort food; the resulting book is more a history of the food in her life than a cookbook. It contains the memories of a century. The lack of an index is unfortunate, because it is difficult to refer to a particular person or recipe, and unless you have a razor-sharp memory, it is hard to recall exactly where you read about Rukka’s first meeting with Kunjappa (the writer RK Narayan) or how to make Ulundu Vadai. 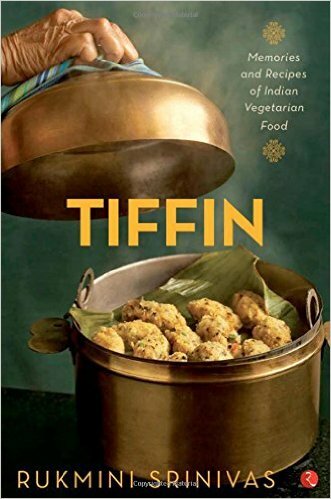 The pictures and illustrations in Tiffin have you sniffing around for the wonderful aromas they evoke; this book is not merely a cookbook but a work of art and a labor of love. Sunita Rajwade is the author of The Fragrance of Mango Blossoms. She lives in Mumbai and writes a food blog at http://www.foodities.in. A pleasure indeed to make your acquaintance and I love your style of writing. I have requested my daughter to get me a copy of The Fragrance of Mango Blossoms and this fragrance rings a very strong bell for me … right from the Ratnagiri Aapus orchards that my father’s friends owned to the stately mango tree in my backyard in Bangalore. Looking forward to many more exchanges, and my best wishes.